Firefighting requires instruction and training. Firefighting, rescue and associated operations are dangerous and may cause injury and death. It is every firefighter's responsibility to be trained and knowledgeable on their equipment, the manufacturer’s recommendations and equipments intended use. The name All Hands is a registered trademark of All Hands® Fire Equipment LLC and may not be used or reproduced without the expressed written consent of All Hands® Fire Equipment LLC. The contents of this website are the property of All Hands® Fire Equipment. All rights reserved. All images, graphics, logos, sounds, and written content included in this site are the property of All Hands® Fire Equipment LLC and may not be re-produced, modified, copied, or re-displayed in any way without the expressed, written consent of All Hands® Fire Equipment LLC. All Hands® Fire Equipment LLC hours of operation are Monday through Friday from 9am to 5pm EST. We are closed on most major holidays. All Hands® Fire Equipment LLC also may adjust hours in order to attend trade shows, major events or in the event of an emergency in which our services are required for customer service/support. If you reach our voice mail, please leave a clear message including your name and phone number. Messages are checked frequently and your call will be returned promptly. 2. Fax using our quote form: Print, Fill out, and Fax our Quote Form to (888) 681-0031. Log into your account and under Orders click Enter an Estimate/Demo/Review. 2. Telephone: Order via telephone (888) 681-1009 using Visa, Master Card, Discover or American Express. (See Store Hours). 3. Fax: Print, Fill out, and Fax your order on our Order Form with credit card information to (888) 681-0031. Log into your account and under Orders, Enter an Estimate/Demo/Review. 4. Mail: Print, Fill out, and Mail our Order Form. Log into your account and under Orders click, Enter an Estimate/Demo/ Review) include Credit Card information, Money Order or Check to All Hands® Fire Equipment PO Box 1245 Wall, NJ 07719. * Please remember when order via Mail to include Shipping and Handling with your order. (See Shipping & Handling Chart). * Orders paid by check will not be processed until check has been cleared from the bank (7-10 Days). Anyone can open an account Sign Up Here, a credit card will be required to place an online order. Fire Company/Departments, Cities, Government Agencies, Military, Private Industry and Companies may be eligible for terms. Please provide a Purchase Order or a Letter of Intent (with Purchase Order number if possible) and faxed to (888) 681-0031 or email to sales@allhandsfire.com . * Please remember to include Shipping & Handling with your order. (See Shipping & Handling Chart). * Accounts in good standing shall be extended terms of “Net 15”. * # 5 Opening an Account is only for Fire Company/Departments, Cities, Government Agencies, Military, Private Industry and Companies. Individual Customers may not open an account. Individual Customer must use options #1 through #4 and prepaying using a Credit Card, Cash, Money Order, or Check. 6. Open an Account to Resell Products: Dealers and Distributors who would like to resell our products must contact us via telephone (888) 681-1009 to Open an Account. In addition, Dealers and Distributors must provide Credit Information prior to any purchase using a Purchase Order. Dealers and Distributors may order by way of Credit Card or Purchase Order. * # 6 Opening an Account to Resell Product is only for Companies (Dealer and Distributors) looking to resell our products. (Individual Customers may not open an Account to Resell. Individual Customer must use options #1 through #4, prepaying via Credit Card, Money Order, or Check). * Credit Card Orders: Credit cards orders will be processed immediately to ensure credit card approval. 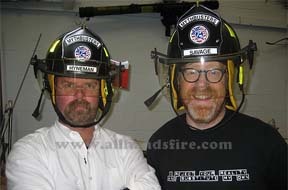 * 24-Hour Order Hotline: Our Website www.allhandsfire.com and Fax Machine (888) 681-0031 is accessible 24 hours a day. * Sales Tax: New Jersey residents pay 7% sales tax. * Cancelled Check Policy: Checks that are cancelled, returned, or otherwise denied by a bank will be subject to a $30.00 charge. * Overdue Invoices: All invoices including those to Fire Company/Departments, Cities, Government Agencies, Military, Private Industry and Companies for products purchased provide the customer with 15 days to make payment (Net 15). For balances past due, a 1.5% interest per month charge may be applied. a. Stock: Products that are in stock are generally shipped out within 24 hours. b. Drop Ship: Products that are to be Drop Shipped (shipped direct from the manufacturer) are generally shipped in 1-2 days, but may also take longer, delivery times will vary depending on the product, time of year, demand and other factors. c. Customized Products: For some customized products, delivery may take longer than 1-3 weeks please contact us for more information on specific items. d. Backorders: Products that are backordered or delayed by the manufacturer may also take longer. In most cases we will contact you if there are additional delays. 2. If you ordered several Products, in some cases they may be sent in separate shipments and from multiple manufacturers. This is done to reduce customers wait time for their order. * Note: Your Shipping & Handling charge will not be affected by this. 3. Orders shipped within the Continental United States are shipped via United Parcel Service (UPS), US Postal Service (USPS) or Federal Express (FED-EX). For larger/heavy items and large quantities, products may be shipped via a different freight carrier. 4. Immediate Delivery such as overnight, next day, and similar expedited shipping requests will require additional charges to the regular shipping and handling charges shown above. Please contact us at (888) 681-1009 or sales@allhandsfire.com to request your order be expedited. 5. Orders are charged $25.00 above standard S&H scale for CN, HI, AK for most shipments. Additional charges may apply. 6. Orders to customers in Alaska, Hawaii and Puerto Rico will be shipped via US Postal Service or UPS Second Day Air. Additional charges may apply. 7. Orders to Canada will be shipped via US Postal Service or UPS Second Day Air. Additional charges may apply. 8. Additional shipping and handling costs may apply depending on product weight, size, length, etc. We will notify you if an additional charge is needed. * For example, certain lengths of hooks (pike poles) and heavy items may require additional freight charges. 9. Orders for Customers Outside the United States: Sales to customers outside of the United States are shipped via Bongo International, this option is available in the check-out process. If you wish to use your own exporter, you and/or your exporter are responsible for all customs paperwork and fees associated with shipping the items from our New Jersey facility or from your exporter’s location within the 48 States. All Hands Fire Equipment does not provide any export paperwork. All export paperwork including HS Tariffs are your responsibility as are all fee's associated with Duty/Tax/Processing. We will provide the goods upon receipt of a Bank Wire Transfer. 10. Military Orders Overseas will be shipped via US Postal Service. Additional charges may apply. All Hands® Fire Equipment LLC offers a diverse selection of fire, rescue, and emergency equipment. Due to circumstances beyond our control, prices may change without notice. All Hands® Fire Equipment LLC reserves the right to change, adjust, modify, or correct pricing that may be advertised on our website or otherwise displayed.